The International Sugar Journal was first published in 1869 and today is the No.1 publication for the global sugar industry, providing producers, technologists, researchers, engineers and consultants with the most up-to-date industry developments as they happen. The journal reports on all aspects relating to sugar cane and beet manufacture, analysis, chemical, microbiology, instrumentation, environmental impact, biofuels, bio-renewables, economics, trade and legislation. Ben Eastick & Avrind Chudasama. 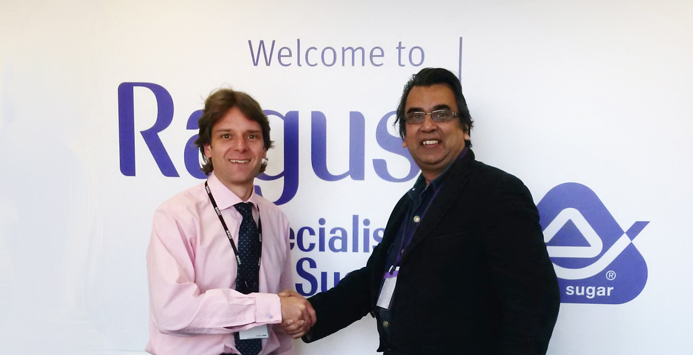 Ragus Marketing Director Ben Eastick welcomed the influential International Sugar Journal to the UK Production Facility. It’s fascinating to see a new be-spoke refinery, a real British success story with a heritage in the industry that is most unique.